First of all – you need to decide if you want off the shelf or personalised lanyards. 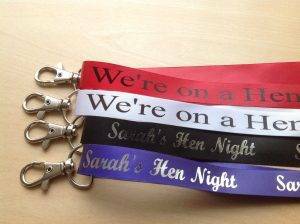 We have pink lanyards already printed with the text ‘We’re on a Hen Night’. These are available now and there is no minimum order quantity. These lanyards have a safety breakaway clasp, and lobster claw attachment. If you want to personalise the text for your lanyard- then we have 2 options depending on how many you require. Ribbon Lanyards – ideal for small quantities – less than 50. We would recommend these for Birthdays and Hen Nights. The advantage of our ribbon lanyards is the message or text can be different on each of the lanyards, the ribbon colour can be different, which means that the minimum m order is just one unit. We have ribbon available and can usually despatch the order to you within 48 hours. All our lanyards are supplied with a lobster claw attachment and breakaway connector as standard. Woven Lanyards – recommended for larger quantities (over 50). These are produced by screen printing the message. This offers a cheaper option for larger quantities – but all the lanyards must be the same. Delivery takes about 10-15 working days. We would recommend that you have the safety breakaway attachment in your personalised lanyards, as this gives you the extra security of knowing that if the lanyard should be caught in something that it would break away at the connector.